Toronto, May 28, 2018—James Harbeck of Toronto, Ontario, is the winner of the 2018 Karen Virag Award, which recognizes exceptional efforts by an individual or organization to raise the profile of editing in their community. The award comes with a $400 cash prize and is named for a highly accomplished member of the Editors' Association of Canada (Editors Canada) who died in 2014. Harbeck is one of the most visible editors in Canada. 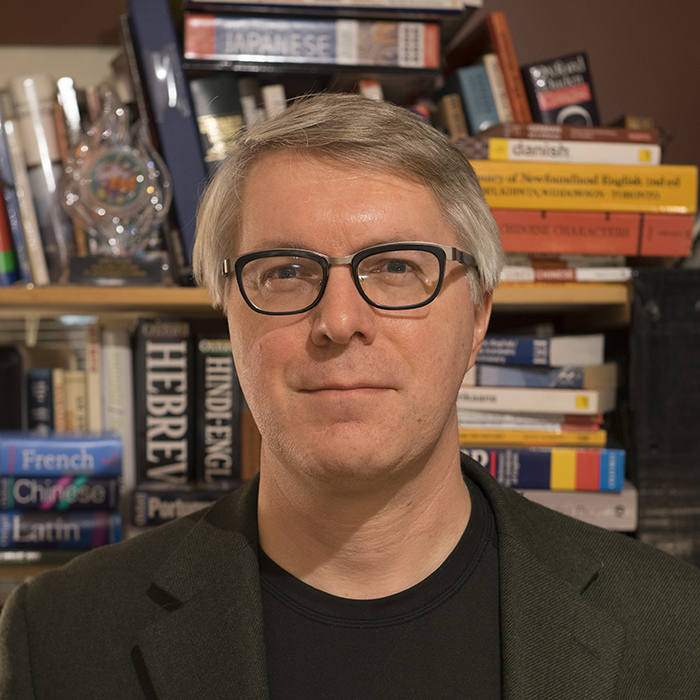 Armed with a wealth of knowledge about editing and subjects ranging from linguistics to design, he possesses a remarkable ability to explain language issues clearly and compellingly, whether in person, in print or on social media. What's more, he relishes doing so. Harbeck has two popular language blogs (Sesquiotica and [with partners] Strong Language), regular columns for The Week, regular republication in Slate and a self-published book of poetry about grammar. He also maintains an active and popular Twitter feed. "It's evident James has done much to elevate the editing profession through blog posts, which are serious and humorous, educational and professional," said one member of the selection committee. "On top of that, James is a sought-after speaker (and much-followed tweeter). His contributions take a variety of forms that attract both seasoned editors and those newly entering (or interested in) the editing profession." The Karen Virag Award honours heroes of editing—the individuals or organizations that champion our profession in their communities year after year. As an ambassador for the editing profession, Harbeck serves a community that is regional, national and international. "At editing conferences (both in Canada and the U.S.), it's easy to find James's sessions," said Harbeck's nominators in their letter of support. "Just follow the sound of raucous laughter until you find the room where people are standing in the hallway to listen and learn." "Entertaining people while educating them isn't trivial; James's lively presence offers living, laughing, loud proof that editing is not just useful but interesting and fun." The selection committee for the 2018 Karen Virag Award is composed of respected Canadian editors and writers. Heather Ebbs, a freelance editor, indexer and writer, has served in countless volunteer roles for Editors Canada, including as national president (1990–91, 1991–92). She is the winner of the 1986 Tom Fairley Award for Editorial Excellence. Allen McAvoy is an editor with a background in journalism, paralegal studies and public administration. Betty Robinson, a science writer and senior developmental editor of elementary and high school science textbooks, has been with Editors Toronto for several years. She has served on the Editors Canada certification steering committee, helped out with the annual conferences and volunteered at The Word on the Street. Karen Virag, a long-time member of Editors Canada's Prairie Provinces branch, was the association's director of publications from 2012 to 2013. In addition to co-chairing the association's successful 2008 national conference in Edmonton and managing the production of Stylistic Editing: Meeting Professional Editorial Standards (2011), she represented Editors Canada for several years on the board of the Cultural Human Resources Council (CHRC). Virag was supervising editor at the Alberta Teachers' Association, and a freelance editor and writer. She regularly wrote book reviews for the Edmonton Journal and articles for The Tomato, a culinary magazine. She also volunteered for Arts on the Avenue, an Edmonton community initiative, and along with Virginia Durksen was well known as one of the Grammar Gals appearing regularly on Alberta at Noon, a CBC Radio One call-in program.